I am glad that Illinois is turning out some great metal. Sure we have had some great stuff come out of our state but it is nowhere near the output from California or New York. 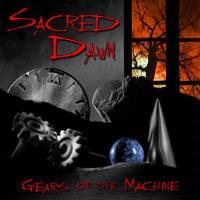 Sacred Dawn hails from Aurora and although Gears Of The Machine was recorded by a 3 piece, they have now added a bassist and switched drummers. I hope this change has not affected the music because I think they are onto something here. I can definitely hear elements of old school metal, some modern metal, and the heavier side of Dream Theater. On a number of songs, Lothar Keller sings in a very similar style to James LaBrie but the Dream Theater similarities don’t end there. Some of the time changes and overall sound of some of the cuts bear a resemblance to Train Of Thought. I hope these guys get some national recognition because of all of the music that I have come across lately, Sacred Dawn certainly have something to offer metalheads and prog fans alike. This review is available in book format (hardcover and paperback) in Music Street Journal: 2007 Volume 2 at lulu.com/strangesound. This mid paced rocker has some really good riffing. Lothar Keller starts off the track in a very deep vocal but as the song progresses; he sounds more like James LaBrie. In fact, the whole track starts to move towards a Dream Theater sound. It is a great start to a very solid disc. The drummer really gets a workout on this cut. It is a little faster and at times heavier but not quite as Dream Theater sounding. It is more of a straight forward metal tune. It sounds like a different singer but according to the booklet, it is Lothar Keller. This cut has more of a latter day Megadeth vibe. Add to that a really nice guitar solo and you have yourself a winning track. Finally, a little reprieve from the full-on metal, this mellow tune builds a little in the middle. It also has a middle eastern feel and during its heavier moment sounds a lot like “Home” by Dream Theater. Back to metal but with a different twist, this time the guys add in some more modern metal sounds to go along with that middle eastern feel. The vocals have little bit of an Alice In Chains style to them but overall the song sounds more modern metal than grunge. In my opinion, this is the only chink in the armor. I can’t put my finger on it but there is something about this cut that just doesn’t do it for me. No bother because there is a whole CD of great tunes here. This song is more old school metal and Keller sings in that James LaBrie style. It is a mellow track but listen to the guitar work; it is awesome. I really like this odd little tune. I say “odd” because it is different from the rest of the album but definitely worth checking out. A great heavy riff (a la “Man In The Box”) starts off this track that would have fit nicely on Dream Theater’s Train Of Thought. This cut has to be a monster live, where I’m sure most of this material gets heavier. There is a heavy intro to this tune but as the track continues, it is more of a moody progressive piece. Even though it is only 5 minutes long, it is packed with different parts that keep it interesting. This piece has an old school thrash vibe about it but there are slower parts that keep this from being a mosh pit thrash fest. I can’t believe that the guys put this tune so late on the album. By far, this is the best cut on the CD. It’s a mid paced rocker with vocals that have a hint of Bruce Dickinson. The guitar is also really good and fits the song perfectly. It's back to old school thrash on this one, but with better vocals. Keller also puts in another great guitar performance which makes me wonder why these tunes were last. I have listened to the disk about 10 times and I still pick out new parts that I like. I didn’t care much for this tune at first but now, it is one of my favorites.